Online brand infringement can divert legitimate traffic, damage brand perception and significantly decrease revenue. A large amount of online infringement is through the registration of infringing domain names. 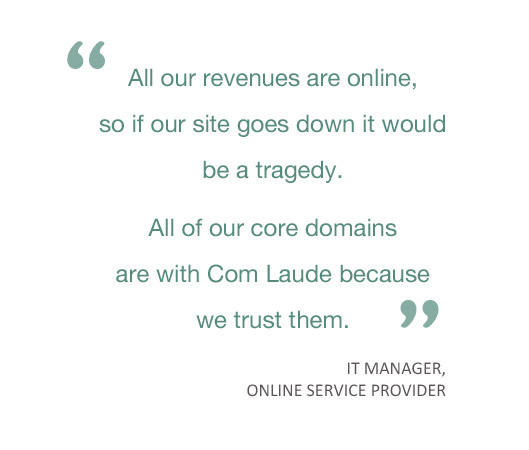 At Com Laude, we help our clients identify, assess and address these infringements strategically in the most cost-effective manner. Our proprietary domain name brand protection platform will alert you, and us, of potential infringements. Our experts then assess the impact and consult you to decide the appropriate next steps. Our Domain Disputes services can support this process. Infringements are addressed with the appropriate level of action; ranging from discreet acquisition, negotiation, cease and desist, or a formal dispute. Our team has extensive experience with various dispute resolution procedures and have successfully acted against respondents across the EMEA, the Americas, Asia Pacific and Australasia. Our success rate on brand infringement actions is 100% of decisions published in favour of our clients. Our clients have included famous celebrities, luxury automakers, and government organisations. Our team works closely with legal practitioners and can provide technical support and forensic evidence to support court litigation or assist with bona vacantia issues. Our team can also act on your behalf, as expert witnesses. Our team can strategically advise you on a domain name strategy and guide you through the process of registering marks with the TMCH. This provides rights protection mechanisms and benefits related to advance domain name registration periods and notifications on other potentially infringing registrants. To see how our brand protection service would impact your business, complete our contact form for a free demo.